Berlin (Germany) – October 27, 2017 (travelindex.com) – Luxury travel is booming: high-price trips grew nearly twice as much as global travel did in general over the past years – most luxury travelers come from the USA and China – Germany and France are the most popular luxury travel destinations in Europe – ITB Berlin and IPK International analyze global luxury travel. More and more holidaymakers are spending heavily on the best weeks of the year. 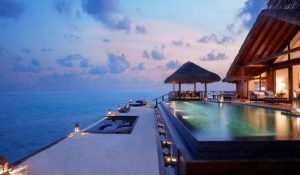 With an increase of around 18 per cent since 2014, luxury travel has grown nearly twice as much as international travel in general, which grew by about 9 per cent since 2014. This is the result of a special evaluation of the World Travel Monitor®, conducted by IPK International and commissioned by ITB Berlin. For this analysis, international luxury trips were defined as all outbound short trips of up to three nights with a spending of more than 750 euros per night as well as all outbound long trips of four nights and more and a spending of more than 500 euros per night. In 2016, the world population undertook about 54 million international luxury trips. The market share of these trips rose to around 7 per cent in 2016. The largest source markets for luxury travel are the USA, with 13.7 million foreign luxury trips, and China, with 10 million. Other major source markets are Japan, Great Britain and Taiwan. In Europe, most luxury trips are undertaken by the British with 3.6 million trips, ahead of the French and the Germans. On the other hand, the most popular luxury travel destination by far was the USA, with 8.1 million trips, ahead of Canada and Germany. In Europe, Germany received nearly 4 million luxury travel visitors in 2016 and hence replaced Italy as the number one luxury travel destination in Europe compared to 2014, followed by France, Italy and Great Britain. Holidays abroad together with trips to visit friends and family and other leisure trips represent the dominant share of all luxury trips with nearly 75 per cent, while business trips account for every fourth trip. The most popular types of luxury holidays are city trips with a share of 29 per cent, followed by touring holidays as well as Sun&Beach holidays. For luxury travel planning the Internet is used by around 83 per cent, which is very similar to all international travelers. On the other hand, 51 per cent of international luxury travelers use travel agencies as an information source, while the worldwide average is much lower with 33 per cent. The same occurs when it comes to travel agencies as a booking site. While on average 27 per cent of all international outbound trips are booked through a travel agency, 40 per cent of all international luxury trips are booked via a travel agency. More detailed information on destinations and source markets as well as the characteristics of the outbound travel behavior of Luxury Travelers can be found in the “World/European Luxury Travel Report”, which can be ordered from IPK International. The World Travel Monitor® Forum is an exclusive industry gathering which discusses the latest travel trends and forecasts of tourism development, taking place on the 9th and 10th of November 2017 in Pisa, Italy. A summary of the Forum’s main findings will be published in the ITB World Travel Trends Report (for last year’s edition click here: www.bit.ly/2tvgbN2).